Enterprises today are ever more focusing on building business applications that can support and boost growth and create a much more sustainable business environment. Enterprises that lag in IT adoption and are unable to go with the trending technology requirements are bound to disappoint their customers. In fact, per a recent Forrester Research, an overwhelming 97 per cent of executives surveyed admit that ‘customer experience’ is critical to the success of their enterprise. News and research reports on these lines are undeniably creating anxiety around rapid technology upgrades, highlighting the need for building Quality with speed. 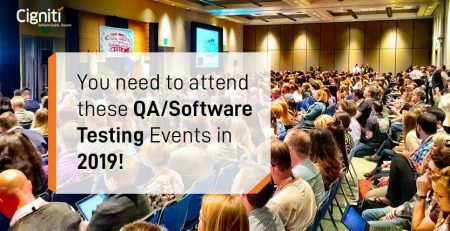 An interesting ITP session is lined up at StarEast on the topic ‘A Practical Approach to QA Transformation in a Global Enterprise – Challenges, Learnings, & Best Practices’. Cigniti’s client Sandra Gaston, Sr. QA Manager, American Tire Distributors, will be speaking at the event along with Kalyana Rao Konda, President, Cigniti Technologies. Register for the session and catch up with us to discuss the QA challenges for your enterprise. Enterprises are encouraging the idea of Bring Your Own Device (BYOD) also referred to as Bring Your Own Technology (BYOT) and working towards making the overall employee-device interface secure. However, there is growing concern around security of these applications. A recent report by ResearchAndMarket on ‘Global Security Testing Market Insights, Opportunity Analysis, Market Shares and Forecast, 2017 – 2023’ estimates that the global Security Testing Market will grow at CAGR 19% by 2022. The report further discusses data security concerns around implementation of IoT and BYOD. The primary goal is to align every such initiative with your organizational objectives and drive it as a holistic and integrated effort. Enterprises are inclining towards QA Transformation or Test Transformation to redefine their quality and testing goals to align them effectively with the business objectives. It implies that a set of processes and methodologies will be defined on the basis of the business objectives and eventually derive tangible returns and ensure constant enhancements. Testing Practice Centre of Excellence (TPCoE) has been considered amongst the most prominent trends in the software testing space. Though it has been around for some time, it is predicted by experts that it will continue to rule the space even in the near future. TPCoE brings with it defined processes, methodologies, frameworks, dashboards, and workflow models, that, when implemented, will instill change and transformation across the enterprise. For instance, if the organization decides to take the Agile Transformation approach, there will be an obvious change in the way each function would be required to operate and collaborate horizontally and vertically. The underlying idea is to invariably align every practice with the business / organizational objectives and to ensure that every practice and methodology adopted gets accepted and endorsed by every person within the system. Technology will definitely dominate the overall process, but it is critical to focus on the human element while taking up the transformation journey. It is evident that if technology overrides the people aspect, the entire QA transformation objectives will go for a toss. With the trending digital technologies and need for Digital Transformation, the perspective of enterprises is getting much more user-centric. This has redefined the way QA Transformation process is being perceived and strategized. Let’s consider some essential principles of QA Transformation, which can also be considered as a practical approach towards implementing the same in a global enterprise. QA transformation cannot be viewed in isolation, as the idea of transformation and quality is for the entire organization. Developing a pathway is essential to make the investments worthwhile and eventually derive higher ROI. People are the most integral part of any change and transformation strategy. With the transformation strategy in place, there will be a need to develop new skills and capabilities. It might lead to anxiety and resistance from people. So, it is important to take a systematic and fact-based approach towards transformation that begins with data collection, analysis, planning, and implementation. The facts collected from this approach will help design the strategy and processes. The key is to make it a disciplined approach rather than a reactive one, which might lead to uncertainty and leave the effort futile. As mentioned, change and transformational activities within the enterprise may lead to uncertainty and lot of queries. If it starts from the top management, it can be reassuring and motivating for the people in the value chain. So, it is important to make the processes work by instilling it from the top. Moreover, executive teams will be in a better position to align the processes with the business objectives and the organizational culture. This further offers scope for remodeling the strategy and processes for transformation. For instance, the top management will be able to decide whether DevOps is the right approach for the business or if Agile is required for sustainable growth? Getting a buy-in from users could be a miniscule task, but assigning owners for the transformation activities requires substantial efforts. When the transformation task is set in motion, change agents or leaders can be appointed to drive the process across each level. These leaders can undergo specific training to imbibe the required capabilities and accordingly share their learning with all. Every strategy works on milestones and targets – either short term or long term, as required. It is important to keep all the communication channels open and active with these targets and challenges associated while meeting them. So, it is best not to assume that things are well understood. Sometimes it is important to just share the obvious. The best strategy is to keep on emphasizing the key messages and changed processes through a prominent communication channel. This can lead to excessive communication, but it is required during desperate times. Technology is the key reason for the entire QA transformation process, so it will dominate the scene. However, unless technology aligns with human efforts and synchronizes seamlessly with the organizational culture, change/transformation in the real sense is impossible. This call should be taken right at the beginning while building the transformation strategy. Aspects such as core values, organization structure, and vision, should be considered before taking up an approach. The fact remains that the same approach can work for some enterprises and might not work for others. For instance, Agile Transformation might work for one business domain, but might not fit well for another. 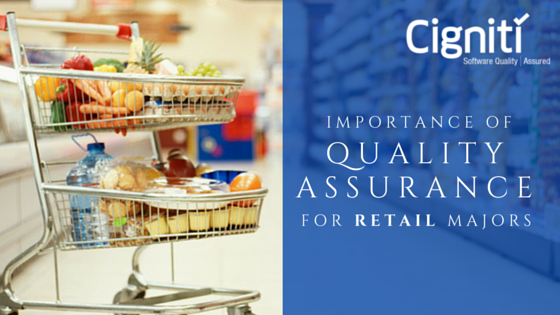 Cigniti has been working with enterprises to successfully implement QA Transformation across various functions, and also garner higher ROI. Our Advisory and Transformation Services enable organizations to understand and streamline their focus on QA – people, tools, and infrastructure across the delivery lifecycle. Cigniti’s Transformation Services are structured to help clients embark on their QA transformation journey with effective metrics driven QA practice. Cigniti is a proud Platinum sponsor at StarEast and we are super excited to be there with our software testing and QA leaders. Click here to register for the session and catch up with us to discuss the QA challenges for your enterprise. Thomas Poirier, IT Manager at IDEXX Laboratories will also be speaking at the event on the topic ‘Building a Performance Test Capability from Scratch’. Cigniti is closely associated with IDEXX and has been a strategic testing transformation partner for the organization. Cigniti’s Automation framework has helped IDEXX to reduce the total test effort by 40% and enhance test coverage by 20%. 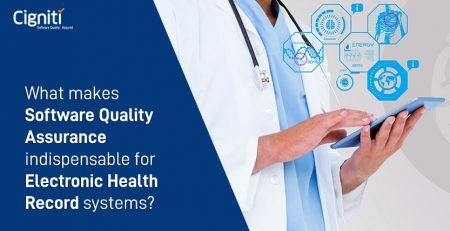 What makes Software Quality Assurance indispensable for Electronic Health Record systems?